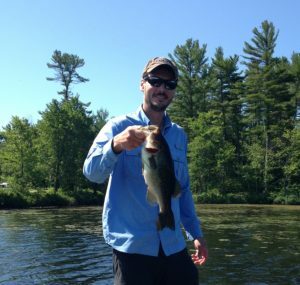 In Part 1 of this series we looked at catch-and-release best practices gleaned from Jacob Brownscombe’s recent paper in Fisheries Research(1). In the previous post we went from catching the fish through to documentation. In this post we’ll continue with a look at methods of assessing fish condition and various recovery tactics. The biggest issue related to fish mortality is deep hooking in the esophagus, stomach or gills. In general, deeply hooked fish have a higher mortality rate although, as we saw in part 1, cutting the hooks or line results in significantly reduced mortality compared to attempting to remove the hook(s). Skin damage from line or abrasions from nets, rocks, boat surfaces etc. Barotrauma for fish coming from depths (for fish that can’t expel air – bass, walleye, pike). Can occur from as little as 5 m for smallmouth bass. Slow retrieval does not work for these type of fish, as compared to fish that can expel air such as lake trout – in this case allowing them time to “burp” as they are being retrieved can be beneficial. Tail grab and body flex are the first reflex impairment indicators (RI) to stop. What this means is that an unimpaired fish will struggle to escape from a tail grab and will flex its body while holding it. Intuitively we know that a freshly caught fish that is hard to hold onto can be released with extremely good likelihood of survival. Even if a fish is not responding to these it is still unlikely to have delayed mortality. The problem is the fish will be susceptible to predators while its escape response is impaired. A good sized largemouth bass released in northern waters will be fine (barring the presence of a large pike or musky), however, one released in Florida with gators nearby is not going to fair well unless it is released near cover – a common practice for many Florida anglers. Ability to self-right when inverted, i.e. equilibrium loss, is the next level of impairment. This is a sign of poor condition and will require recovery methods to be applied. A fish released with this issue will be helpless to predators (larger fish, birds). Head complex (consistent, active opercular ventilation), i.e. pumping of the gills, and vestibular ocular response (VOR), i.e. moving it eyes to track level when rotated, are signs of the highest level of impairment. These are both governed by the autonomic nervous system, much like breathing is for us. If they have stopped it means the fish is near death and harvesting the fish, if regulations permit, may be the best option. For bass tournaments, where fish are held in livewells for extended periods, the current science suggests holding the fish at a low density (the bigger the livewell the better), with circulating water at ambient temperatures and oxygen levels is ideal for survival. When harvesting is not permitted and/or unwanted there are a number of tactics that can be employed to help an impaired fish recover. The science for “pumping” a fish or holding it upright in flowing water suggests that this is not effective for fish recovery. Indeed, the act of contact and of holding the fish is an added stressor to the fish. Holding the fish in livewells in ambient temperatures and normoxic (ambient oxygen levels) appears to be a much better option. This is a favorite tactic of dedicated musky anglers who have developed higher flow holding livewells for recuperation. For bass tournaments, where fish are held in livewells for extended periods, the current science suggests holding the fish at a low density (the bigger the livewell the better), with circulating water at ambient temperatures and oxygen levels is ideal for survival. One study(2) showed that the common practice of lowering livewell water temperatures with ice resulted in increased lactate levels and slowed replenishment of muscle energy stores even though the lower water temperature resulted in higher dissolved oxygen content. Increased temperatures (compared to an ambient baseline of 25 C) with lower dissolved oxygen were found to be (more obviously) detrimental. The study also found that creating a hyper-oxygenated environment using oxygenators actually caused moderate physiological impairment in bass. Good points to think about here is what is the water temperature in your livewell verses what is the water temperature that the fish came from. Are the fish coming from shallow or deep where the water may be noticeably cooler? Did you fill your livewell in a marina or back bay where the water temperature is 5 degrees higher than the main lake? Are you recirculating water or adding water of differing temperatures in from the lake during the day? The benefits of livewell additives was mixed. It was noted that there is a huge diversity in additives with little research done on most of them to date. The two common methods for relief are “fizzing” and rapid recompression and release. The effectiveness of fizzing is a hotly debated topic. Studies have shown a variety of pros and cons. It does appear that results are highly species specific, with effectiveness for some species much better or worse than others. Proper knowledge and methods need to be observed. Recent concerns for needle cleanliness and delayed mortality due to infection have been voiced. An in-depth methodology for this technique is beyond the scope of this post. Rapid recompression and release is usually achieved by the use of weighted descending and release devices. Rapid recompression returns internal gasses to appropriate pressure quickly and appears to be as or more effective than fizzing (venting) techniques. Again lots to consider here but definitely worth your time to think about how you can implement these practices into your fishing routines. (2) Suski, C.D., et. al., The influence of environmental temperature and oxygen concentration of largemouth base from excersise: implications for live-release angling tournaments. J. Fish. Biol. 68 (2006) 120-136.